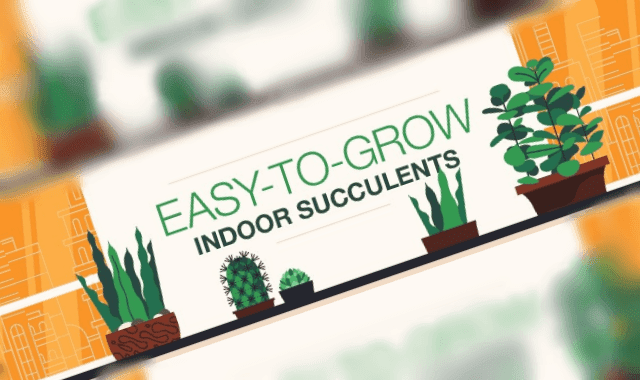 Easy-To-Grow Indoor Succulents #Infographic ~ Visualistan '+g+"
Plants are an easy way to add a little life and beauty to your home or office. But without the proper care, you may find yourself cycling through different varieties more frequently than you’d like. Thankfully, succulents are very easy to take care of and require very little to thrive. We’ve rounded up seven types of indoor succulents perfect for any skill level, including crown of thorns, aloe, jade, and Christmas cactus. Not sure where to start once you bring your succulents home? We’re here to help with simple tips—like how much and how often you should water—to keep your plants happy and healthy indoors. Check out the infographic below to learn more.